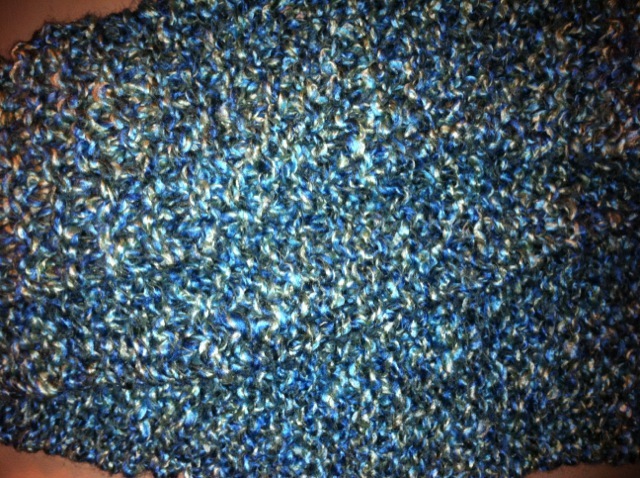 Scarf #3 | Ooh Something Shiny! I really like this one. The colors remind me of spring which is odd for a scarf. I knitted this one almost entirely on a trip cross state to take our youngest back to school (I wasn’t driving). Its kind of amazing that you can get into a car with a skein of yard and a some knitting needles and get out a few hours later with a finished garment. These are super simple scarves though. Knit on both sides, chunky yarn. The needles are size 14 I think and I usually cast on 12 or 14 stitches and keep going until the scarf is about 6 ft long. My husband and I were joking about what a lousy engineer I would make because my measurement technique on the last one was to have him hold the scarf up to see if it was as tall as he was. To measure this last one while I was in the car, I folded the scarf across a magazine I surmised to be 12 inches high until I had a stack of six layers.